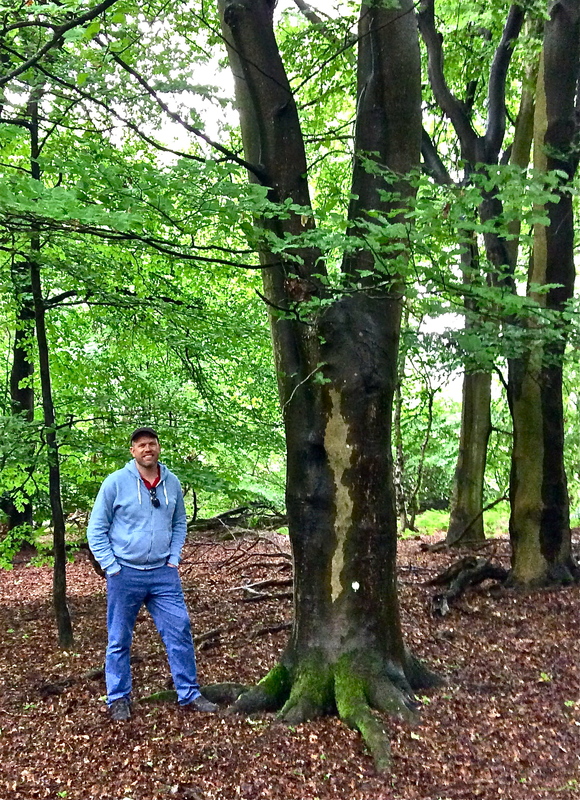 FORSTER’S FOREST The writer at Piney Copse, June 2014. AFTER spending most of the 1990s living in England, I returned with my husband in the spring of 2014. As soon as we arrived, I navigated while Richard drove us across the Thames and out of London towards Surrey. Once we crossed the M25, we were swallowed by the high hedgerows of the Hackhurst Downs, before dropping into the village of Abinger Hammer in search of one very hallowed place for this writer. The region boasts two famous former residents: actor Prunella Scales (Sybil in Fawlty Towers) and the author Edward Morgan ‘E. 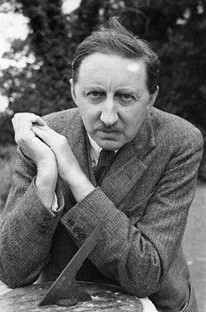 M.’ Forster (1879-1970). I first encountered his novels at school, although it took reaching the age of forty-four to fully understand him. My life had taken various ‘Forsterian’ turns in the interim, and I had a new appreciation of why he penned barely a word of fiction for the four decades after moving to Abinger Hammer in the wake of his bestselling 1924 publication A Passage to India. Forster’s public explanation was that he’d had enough of writing politically-light novels like A Room with a View and Howard’s End, although after the private experiment of his gay romance Maurice – which crucial gay friends unfairly criticised – and several controversies of gay literature breaching the criminal code, none of his gay-themed writing saw the light of day until after his death in 1970, the year of my birth. FORSTER’S WAY English novelist Edward Morgan Forster by Howard Coster. Moving to a genteel Surrey village ought to have been a source of inspiration, but it left Forster in a career limbo at the age of forty-four, living with his elderly mother Lily. The pair found a hopeful new start to their codependency when they moved to an Abinger property – West Hackhurst – designed and built decades before by Forster’s architect father. The Forsters already had connections in the region, notably the Farrers of Abinger Hall, an estate from which West Hackhurst had been hived off on a sixty-year lease, which allowed Forster’s Aunt Laura to see out her days there. The remainder of the tenancy she left to her nephew. Before moving in, Forster made inquiries with Tom, Lord Farrer, who agreed that should Mrs Forster still be alive when the lease expired in 1937, an extension would be granted to cover the remainder of her life. Forster’s problem was not inspiration, but rather that he’d come to terms with his sexuality and had been putting it into practice. Surrey was altogether too straightlaced, and the threat of discovery – by Lily, or the police – was greater outside the city. But he had rooms in London, and with the Gomshall railway station only minutes’ walk from West Hackhurst through a small forest and across an empty field, Forster was happy to compromise with ongoing maternal cohabitation. Until this escape route of his came under threat. The appearance of workmen digging in the forest alerted him, and he made immediate inquiries with the vendor, who revealed a potential housing development. So too did Lord Farrer, who honourably allowed Forster first refusal on the small block known as Piney Copse, slotted between farms, homes, and the railway. The American royalties of A Passage to India gave Forster the purchasing power to cover the 450-pound settlement. BEECH BOUGHS Forster planted Piney Copse with beech trees after 1924. While ruminating on the practical and philosophical concerns of land ownership, he made a few attempts to beautify his forest, planting beech trees and discouraging oak seedlings, which he despised as too patriotically English, and settled into comfortable inter-war life in the village. Meanwhile, he secretly started the significant relationship of his life, with London policeman Bob Buckingham. But around the same time as the threat of Nazism began to rise beyond Germany’s borders, another war was waged at Abinger Hammer. Forster inadvertently started it when he made inquiries with Lord Farrer about extending the lease. Friendship had not flourished between the neighbours, and the Forsters stewed on it. Perhaps they were considered ‘staff’, since Lily had been a governess to Farrer children decades before? Or perhaps Lord Farrer was still piqued at missing out on purchasing Piney Copse? It’s likely, since he made its future a stipulation of Mrs Forsters’ residence beyond 1937, when lawyers communicated she could stay for the duration of her life, but only in exchange for ownership of Forster’s forest. “I was to give up my beloved wood, the one Surrey object that had roots in my heart,” Forster wrote. TREES IN TRUST The western boundary of Piney Copse, Abinger Hammer, Surrey. 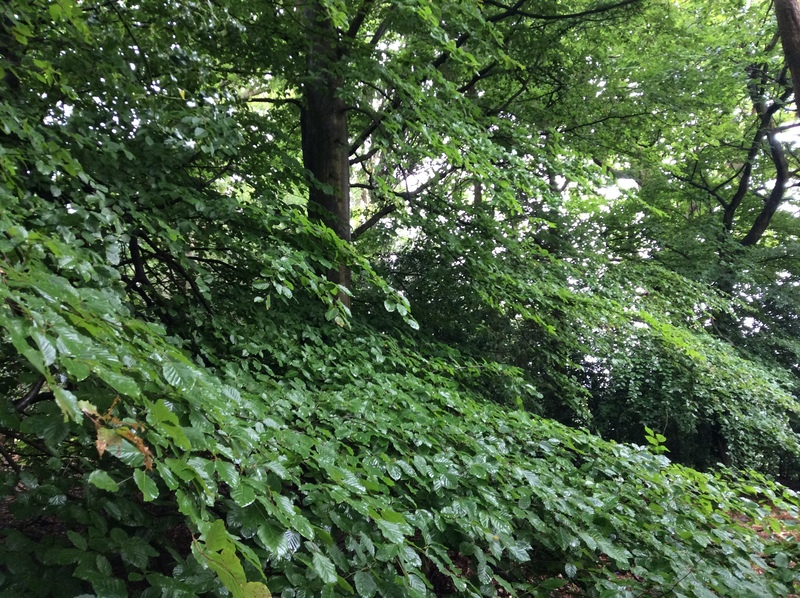 He moved quickly to take Piney Copse out of the equation by leaving it to the National Trust in his will, purposely choosing an organisation the Farrers could not object to, since Lord Farrer sat on the committee. These angry reactions were the opposite of Forster’s regular, more tempered appearances in BBC Radio broadcasts, which became the mainstay of his self expression and fame after 1929. His popular WWII talks on fear, identity and faith got him onto Hitler’s hit list at the same time as he was doing battle with the Farrers over land, leases and access. Lily Forster died in the closing months of the war, and the Farrers moved quickly to reclaim West Hackhurst. Forster’s heart, and his home, were broken when he left in a painful separation we’d now call a mid-life crisis. 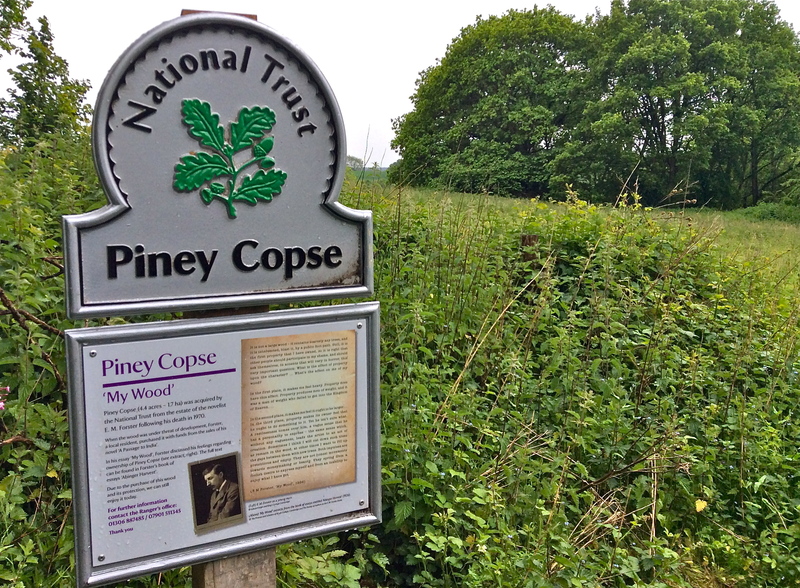 The first time I followed these stories to Piney Copse twenty years ago, there were no signposts and the whole block was so overgrown it was impossible to take a decent photograph. I was there on a location recce, having started the process of producing a film of Forster’s 1909 short story Other Kingdom. The setting of his allegorical tale was a beech forest adjacent to a genteel home, with leases and fences and local battles over land ownership, and a pivotal escape route for a troubled protagonist. I had a suspicion Forster’s ownership of West Hackhurst and Piney Copse was a case of life imitating art. The house was still visible from within the beech thicket. Walking the fence line, I got an up-close glimpse of the old place, which seemed uninhabited. It would have served ideally as the location for a film. House and forest came in one package in a very quiet neighbourhood, and the building was just ramshackle enough to have benefitted from the attention of a film crew. But art imitating life imitating art was all too hard to communicate to funding bodies, and my project fell over, although I could never quite shake the memory of Forster’s forest. I started to read his non-fiction more widely, and with the publication of his diaries in 2011, including his searing account of the war over Piney Copse under the ironic title ‘West Hackhurst: A Surrey Ramble’, a clearer picture emerged of the deep hurt at his removal from Abinger Hammer, wrapped-up as it was in his mother’s death, his long-dead father’s memory, and his thwarted sense of place, at a time when it was impossible to live openly as a gay man. I finally realised it’s not Forster’s art that runs deepest at Piney Copse, it’s his life. He never wrote fiction again, and left his entire body of work to the place that took him in after his flight from his father’s house – King’s College Cambridge. His forest of trees – unprocessed novels in their rawest, elemental form – was wired-up on his departure in 1946. I am not sure if he ever visited the place again. COPSE AND CROPS Piney Copse seen from the eastern boundary, with wheat growing at the foot of Surrey’s Hackhurst Downs. 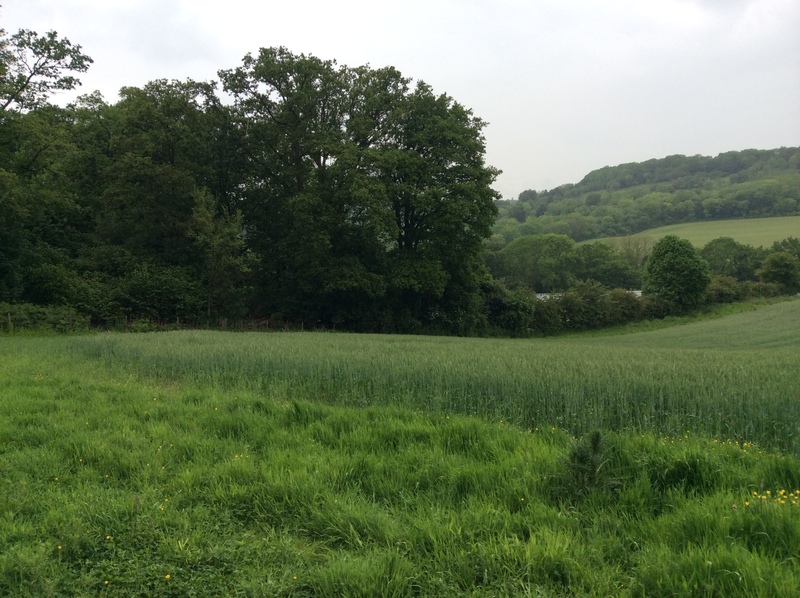 On my return visit to Piney Copse in 2014, Richard and I parked at Abinger Hammer and navigated on foot. Away from the main road, which must have been perilous for pedestrians even in 1920s, we hit a muddy track that seemed to go in the right direction, and soon a National Trust sign showed itself on the western boundary. A train slid by on its way to London, and we took shelter beneath the spreading beeches as heavy raindrops started to fall. Transformed by care, Piney Copse is now closer to Forster’s vision of an egalitarian, shared England. Gates and stiles freely give way to a depth of greenery that shuts off the real world. A shower closed in quickly, coating Forster’s beloved beech leaves. There was light enough that the tresses of foliage held that glow I had travelled the globe to experience in person, again. In a few minutes I had explored this tiny patch of England, heart filled with hope, as rich as a boy’s. Foster’s forest grows on, exempt from the machinations of people and economies, just as he would have liked. Richard was waiting for me on the other side of the gate, and we peered along the drive for a glimpse of West Hackhurst, now restored and inhabited, before tracing our way along farm roads, past ancient fields and the place where the ‘honourable’ Farrers’ Abinger Hall once stood, long since demolished in the wash-up of another of England’s old families. Foreheads wet from the sun showers, and baptism over, we took tea back at Abinger Hammer, in a world changing faster for gay men than Forster could ever have imagined. Thanks Liz, glad you got something out of this article. Forster’s a legend!